Because of the timing of these releases by Nikon, I'll be grouping the information together. The CoolPix 5700 has more infrared sensitivity than previous CoolPix cameras aside from the CoolPix 950. First of all, if you've purchased the CoolPix 5700, get yourself a tripod. We recommend the Velbon Maxi 343E for it's light weight and sturdiness. After my preliminary testing I realized that it's just like any 35mm camera with a long telephoto zoom and we're going to see a lot of images that aren't critically sharp as people get used to their latest camera. 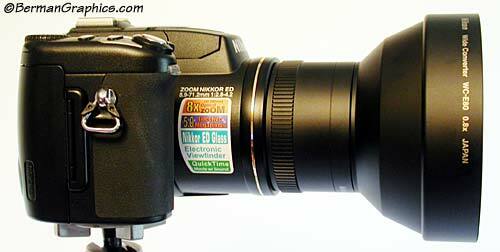 The LCD is smaller (1.5 inches) than the previous CoolPix cameras but because of the reversible design, the Xtend-a-View magnifying finder fits like on the CoolPix 5000. Much easier to see through than the new electronic, through the lens, viewfinder. Small digital cameras should be carried in a belt pouch and held with a wrist strap for best usage. I like the Domke pouches for carrying any of the prosumer digital cameras. I regularly use the Domke Compact Pouch (Cat. No. 710-10B ) for the swivel body CoolPix and have found the Belt Pouch (Cat. No. 710-30B) perfect for the CoolPix 5700 and 5000 when walking around. For a wrist strap, I take the supplied Nikon strap and thread both ends into the strap lug at the top right (facing away) of the camera. Then I knot it twice or three times to make a convenient wrist strap. I've discovered a possible white balance problem (also noted by others with the CoolPix 5000) where when shooting a series of images relatively fast, every few frames appears to have a red cast. This is when the camera is set to auto white balance. Close focus macro. In an informal test, I was able to photograph a 1-3/4 to 2 inch section of a ruler with the zoom set at mid range and the front of the lens about 3 to 4 inches from the subject. It appears you can get the camera closer at mid zoom (82mm in 35mm) than at wide or telephoto. It does take a while for the camera to hunt and lock focus needing a contrasty image. At full telephoto, I was able to get a sharp image with the front of the lens at about 18 to 20 inches and it focused on a 1-1/4 inch ruler section. Full width of original Jpeg shown at left. Focus was tough to attain though with the camera shutting off due to timing out and going to sleep. If you're going to shoot macro, you'll need to change the time out factor from the default. Camera support is mandatory. CoolPix 5700 with WC-E80 wide angle adapter. Heavier without the caps than the camera is by itself. The camera has performed extremely well. I've gotten very sharp images during my limited shooting. But I consider it part of a 2 camera system that consists of the CoolPix 5000 for wide angle and the CoolPix 5700 for telephoto. The CoolPix 4500 has more infrared sensitivity than previous CoolPix cameras aside from the CoolPix 950. A continuation of the swivel body CoolPix heritage. If I were to buy my first digital camera today, knowing what I like about the CoolPix 990, I wouldn't hesitate to pick one of these small gems up and start all over again exploring the possibilities of digital photography. Smaller and sturdier than it's predecessors, it's got that amazing ability to take photographs with perspectives not possible with any other camera. I feel that Nikon should always have a swivel body camera in their line. Like the 5700, the LCD is smaller than previous CoolPix models and the Xtend-a-View finder is going to be redesigned. The RX Flash Bracket from the CoolPix 990 is a perfect fit. It was the most versatile and sturdiest flash bracket ever made for the CoolPix 990. Unfortunately their web site is gone and we don't know if they're still in business. But if you've upgraded cameras and own one of these great brackets, hold onto it. Because of the redesign of the pop up flash from the CoolPix 995, the bracket can clamp between the flash and the synch socket.